Eastern Congo’s Kivu provinces are making slow but steady progress to establish certified minerals trading routes. A total of 20 mining sites qualified and validated as “green” (conflict-free) in North and South Kivu by a multi-stakeholder body made up of the Congolese government, minerals dealers, and local NGOs. 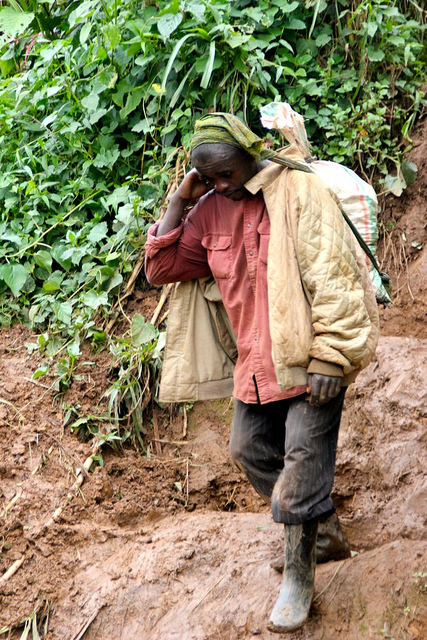 Parts of South Kivu have fortunately been spared from the M23 conflict epidemic that has, in addition to its dire humanitarian consequences, inflicted a blackout on legal minerals flows. Neighboring North Kivu province, where the rebellion has settled itself since May 2012, has borne the brunt of that economic blow. In South Kivu, where the mutiny was quickly quelled by the Congolese army, the electronics company Philips, Motorola Solutions, the Congolese government, and the Dutch Ministry for Development Cooperation have initiated a conflict-free supply chain through a pilot project called Conflict-Free Tin Initiative, or CFTI. This project is a positive step but should be followed up with a permanent independent monitoring system to ensure no conflict minerals leak into the system. The Enough Project joined more than two dozen delegates from Philips, Motorola Solutions, Fair Phone, ITRI, other industry partners, governments, civil society groups, journalists, and the Netherlands special envoy, Prince Jaime de Bourbon Parme, on a four-day trip to see first-hand the Kivus’ first conflict-free minerals supply chain in the works. The process consists of human rights observers who conduct periodic spot checks at the mine, risks management and mitigation plans by local minerals stakeholders, and the tagging system from the mine to the export point. The CFTI project kicked off at Nyabibwe’s Kalimbi tin mine in October 2012 and uses the ITRI Tin Supply Chain Initiative, or iTSCi, to carry out due diligence on a variety of actors along the supply chain, as well as to provide traceability consisting of mineral bags tagging from the mines to export points. “The cash flow movement throughout the supply chain has recovered and is having a positive impact both on the performance of other economic activities as well as on the daily lives of the South Kivu people,” said Albert Mulikuza, chairman of the South Kivu provincial steering committee on minerals trade in a speech to the CFTI mission in Bukavu. Since the project kick-off, the number of miners has risen from 100 to 800 in three months, Mulikuza said. The Kalimbi mine production has increased sharply with 237 tons of tagged and exported tin ores worth $1,773,502 over the same period. However, while the price of a kilogram of tin ore is trading at $6 at the Bukavu based World Mining Company, or WMC—the only minerals trading business sourcing from the Kalimbi mine—“middlemen are buying a kilogram of tin ore for $2.50-$3 at the mining site,” 13 miners at the mine and in Nyabibwe told Enough. The tin price stagnation at the mine is likely to be the result of the involvement of only one minerals trading company, WMC. Miners have been coming back en masse as they hope the situation will improve soon with the possible expansion of the CFTI projects to other mines. Joseph Mudahwa, who has worked as a miner at Kalimbi mine for eight years, said he sees the business comeback as progress that needs to be expanded. “We used to mine and stockpile as we had no buyers [because companies were hesitant to source from Congo]. The fact that our production is selling quickly now is a gain that we need to capitalize on,” he said. “This project is so dear to us,” said Mathew Badosa, another miner wearing boots, a helmet, and a pair of gloves provided for the first time by the government’s Congolese Small Scale Mining Assistance Service program, known by its French acronym, SAESSCAM. Despite its challenges, the certification system at Kalimbi “is like a newborn that we don’t want to throw away with his washing basin,” he said. But Badosa’s comment hints at a number of serious underlying issues. The most important of those is independent monitoring. Loopholes in the ITRI tagging system remain in place. While tags are provided free of charge, unpaid SAESSCAM staff members are primarily responsible for distributing them to mining cooperatives and overseeing the tagging of mineral bags from Kalimbi mines to minerals trading houses in Nyabibwe. Enough spoke to five SAESSCAM and five mining administration staff members at Kalimbi mines, and all claimed they have never been paid by the Congolese government. About 100 minerals middlemen, known locally as “négociants,” are involved in the minerals trade and are overseen by those unpaid staff members, which makes them prone to corruption, constituting a weak link in the chain. In addition, public reporting of incidents regarding the system falls to ITRI, leaving open the possibility that unfavorable indicators could be censored. A critical follow-up to this should be the institution of the Independent Mineral Chain Auditor of the International Conference on the Great Lakes Region. This independent monitoring system is designed to be a team of individuals that would go and inspect mines and trading routes to make sure that tagging and tracing are functioning properly and sanction traders who are smuggling conflict minerals. To date, Rwanda, Congo, and the ICGLR have not given full sign-off to the system, and thus funding from the U.S. government for the project is delayed. That is creating a large loophole for minerals to possibly get smuggled. But beyond the transparency and monitoring gaps, Nyabibwe doesn’t have a minerals trading center to house mineral productions and prevent leakage of dirty minerals into the system. All of the nearly 100 minerals middlemen buying from Kalimbi mines walk away with their mineral loads and keep them in their homes for later business transactions. That alone constitutes significant potential for conflict materials to leak into the supply chain. Further, Enough has spoken to Congolese police and army officials who admit receiving weekly allowances from mining cooperatives as they secure the mines. Major progress has been made in demilitarizing the mines and installing the steering committees to regulate them, but the fact that the army and police can still be entitled to any allowance outside of the Congolese tax framework constitutes illegal taxation. A senior Congolese police officer in Nyabibwe admitted to Enough, for example, that he collected enough money to buy food for the troops under his command. Finally, the conflict-free minerals sourcing pilot project is designed to promote a fair mining business particularly for local communities to pre-emptively remedy the exhaustible nature of the mineral resources exploitation. That was also the spirit of commitments signed by eastern Congo mining operators after the government’s six-month ban in late 2010 which strengthened the influence of military hucksters, particularly Bosco Ntaganda’s led minerals smuggling rings. As part of their effort to lobby the government to lift the ban, local mining stakeholders, civil society, and the Congolese provincial and national mining ministries signed a series of acts committing to humanize the eastern Congo mining sector and comply with the U.S. law requirements to be able to sell to American companies. But since the CFTI launched in Nyabibwe, WMC has failed to fund any social or livelihood development programs despite the fact that it has made about $2 million in exports in the last three months.